Does Marshalls Take Apple Pay? Does Marshalls accept Apple Pay? No. Marshalls does not accept Apple Pay in stores or online. You can’t pay with Apple Pay at its sister stores — including T.J.Maxx and HomeGoods — either. For more on the store policy, see below. No, Marshalls does not accept Apple Pay, a company official said. Marshalls’ sister stores — including T.J.Maxx and HomeGoods — also do not accept Apple Pay. Instead, customers can pay in-store with cash; debit cards; credit cards (Visa, Mastercard, American Express, and Discover); store credit cards (TJX Rewards and TJX Rewards Platinum credit cards); Marshalls, T.J.Maxx, or HomeGoods gift cards; and major branded gift cards like Visa gift cards. Customers shopping online can also pay with a PayPal account. 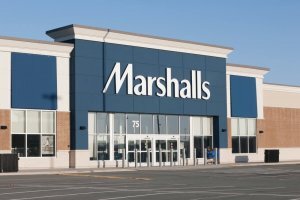 Marshalls is a department store chain owned by TJX Companies. For more on payment options at TJX Companies’ retail stores, see the company’s website. That’s the Marshalls Apple Pay policy. Marshalls stores do not accept Apple Pay. Accepted forms of payment include cash, debit cards, credit card, store credit cards, and gift cards. For more on Marshalls’ discounts, see our article: Marshalls Senior Discount Day Questions Answered. You may also be wondering, Does T.J. Maxx take Apple Pay?